Simple, dependable and powerful, there is no reason to not carry the SOG TWI-201 Twitch XL Tanto Graphite folding knife. 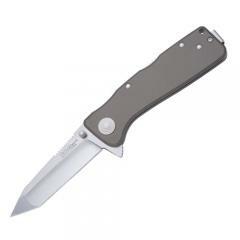 Featuring an anodized aluminum handle and a durable AUS-8 steel blade, the knife is built to last. A ruggedized, graphite handle is perfectly weighted to sit comfortably in users hands while providing a superior grip and optimal handling. The strategically placed quick-release tab allows for ambidextrous, rapid blade deployment with a press of the finger. The durable blade features a reinforced Tanto-style tip, providing maximum piercing power. A reversible pocket clip completes the package, allowing for convenient right or left-handed carry options.